Whether you are looking for your dream dress, options for your bridesmaids, or something classic for the moms, capture hearts with our latest bridal gowns and bridal party styles. Every dress is a finely spun love story designed to perfectly illuminate your unique bridal style. For the modern bride, this one shoulder gown is a timeless and sophisticated option with its sleek silhouette and ethereal cape. Alternatively, the defined waist and deep-v neckline give this satin gown an elegant and classic feel, while the ruffled back offers a major statement. The always-on-trend bride will adore this A-line gown, featuring a flattering neckline and intricate floral embroidery. Walk down the aisle in beautiful, gem encrusted pumps. Blush is a classic option for spring (or any season). From pale pink to rose, shades of blush will flatter any skin tone. This rose gold gown is the perfect option to add some pretty shimmer, without outshining the bride, and is a flattering silhouette for all. For a black tie-inspired wedding, this halter gown fits the bill with its soft blush hue, feminine shape, and delicate embroidery. This all-over lace gown is chic, figure-hugging, and offers a subtle touch of glam with its side slit. Complete the look with a pair of criss-cross rose gold heels. Soft, subtle and totally dreamy, your bridal party will love this romantic colour palette. Show off a pair of standout heels in this high-low gown in a lilac hue. Light, airy and flowy, it will easily go from aisle to dancefloor. This halter gown is beautifully detailed by a watercolour print and elegant cascading ruffles. For a full-on glam affair, add some major sparkle to your bridal party in this sequined gown. With the softest glint of lilac, this glitzy option features a dramatic trumpet skirt and a front slit. Finish the ensemble with a pair of these satin ankle-strap pumps. Get ready to fall in love with this ethereal colour theme. Soften up your bridal party style with this halter gown in a pastel mint, featuring a lace sweetheart bodice and intricate buttoned back. For a destination wedding, be inspired by the turquoise waters in this watercolour option. The lightweight chiffon makes it perfect for a tropical and breezy beach ceremony. This chiffon gown is a flattering silhouette for all, with its wrap-like design and twirl-worthy skirt. A pair of peep-toe heels will be the ultimate finishing touch. Deep and rich navy hues are as sophisticated and timeless as they come. 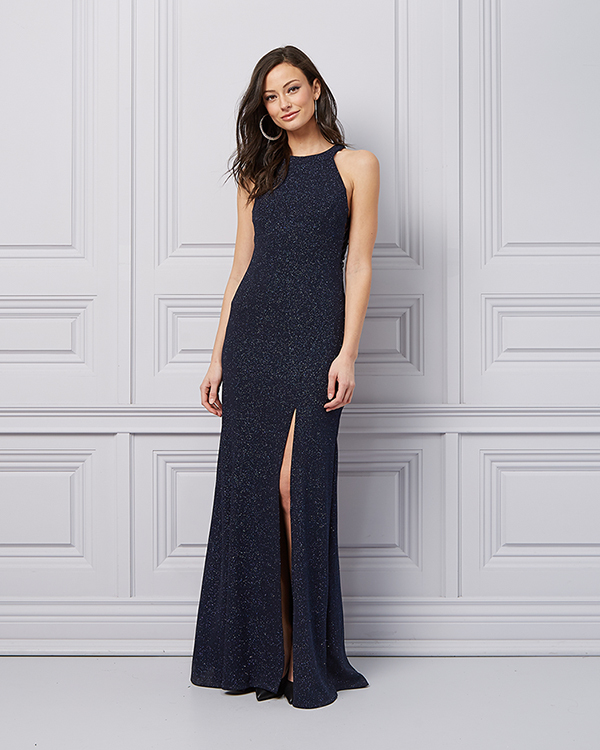 This dark navy gown is perfect for both moms and ‘maids. The graceful silhouette is dressed up by a dramatic one-shoulder, ruffled sleeve. This halter gown offers a subtle hint of opulence with its sparkle knit, empire waist, and front slit. For a unique bridal party option, this strapless number is a mix of femininity and playfulness. The voluminous skirt is detailed by embroidered florals and a dainty bow waist. Complete the look with eye-catching jewellery. The neutral palette is perfect for mixing and matching. Combine both darker and lighter hues for a picture-perfect effect. Your leading ladies will “wow” in this criss-cross halter gown in a dusty blush hue. Short and sweet, this lace & chiffon option, designed with a romantic floral bodice and a ruffled skirt, works well as a “wear-again” dress. 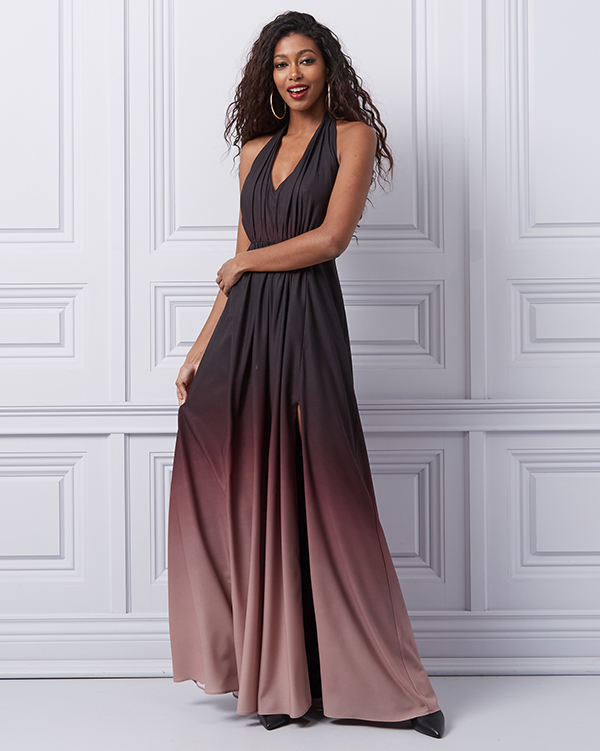 Add a sartorial twist to your bridesmaid’s style with this ombré chiffon gown. Get ready to dance the night away (and catch the bouquet!) in this unique dress. Shimmering extras add that extra dose of shine to the look. Fall head over heels over our spring 2019 wedding selection here.